The week before Easter of history and tradition. 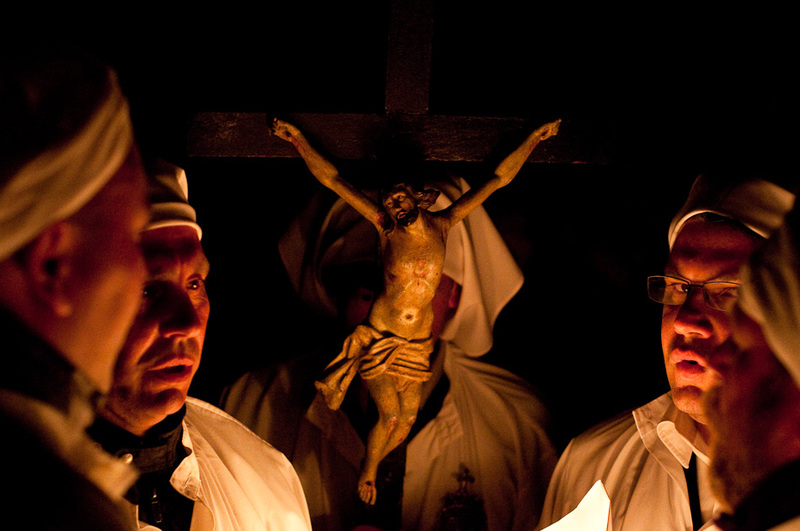 PERIOD: THE RITES BEGIN MONDAY AND CONCLUDE THE SATURDAY NIGHT BEFORE EASTER. During Holy Week, beginning on Palm Sunday, Bosa celebrates the rites that recall the passion and death of Jesus and his resurrection on Easter Sunday. 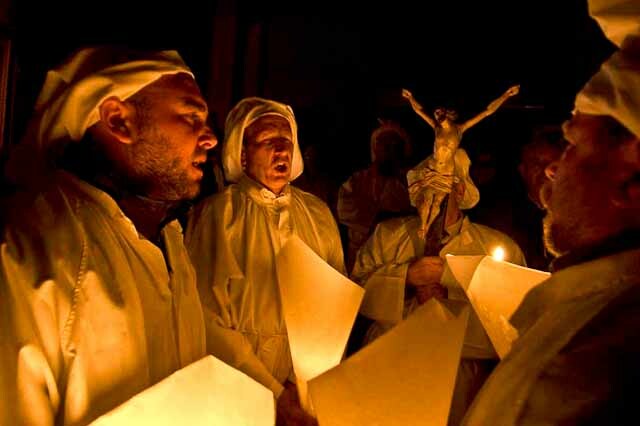 All of the processions involve the Choir of Bosa singing traditional ‘gosos’ (sacred songs) of suffering and penance, and take place on Tuesday and Friday and the exultation on Easter Sunday. On Tuesday there is the procession of the Holy Mysteries, during which the members of the Brotherhood of the Holy Cross carry upon their shoulder the five great statues of Jesus; in the garden, the scourging, the crowning with thorns, Christ’s journey to Calvary, and Our Lady of Sorrows. Sacred images are carried from the Church of the Holy Cross, accompanied by a long procession, through the narrow streets of the historic centre to the Cathedral. On Thursday, people stage ‘the washing of the feet’ during which the priest washes the feet of altar boys representing the Apostles. At night it is possible to visit the picturesque Tomb, held in the chapels of the churches in the city and in which is placed the Blessed Sacrament. On Friday morning the procession starts from the church of Carmel, leading the statues of Christ, the Cross, and Our Lady of Sorrows to the Cathedral, where there is the ‘S’Incravamentu’: the crucifixion of Jesus. In the evening the ‘S’Iscravamentu’ takes place which is the presentation the body of Christ to the Virgin Mary and its deposition in the tomb. After the ceremony a long procession accompanies Jesus to the church of the Carmine, where the statue is exposed so that believers can touch it. On Easter Sunday the bells begin to ring and ‘S’Incontru’ is enacted in Piazza Costituzione (Constitution Square), featuring the risen Christ and the Virgin Mary accompanied by two different processions.